International Speak and write in English. 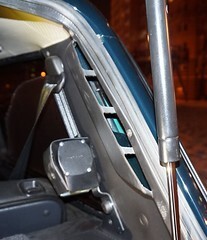 The rubber baffle in the car body air vent opening located inside the rear pillar which normally excludes external air entry into the car body, is often pushed-in by the air inflow, bringing-in raindrops and snowflakes which eventually drop onto the lower rear portion floor behind the rear wheelarch and accelerate body corrosion. Besides, if pushed-in and stuck inside the body, the vent baffle hinders normal air outflow, which also increases moisture inside the car body. It appears that such moisture can be decreased by preventing the vent baffle from pushing-in inside the car body. This can be provided by installing a narrow vertical plastic strip in the air vent opening. In other words, the existing horizontal partition in the air vent is not sufficient, the vertical one is needed as well. 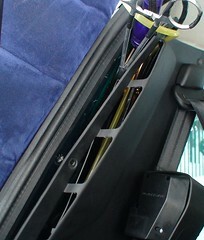 The cheapest means to provide this would be a bundle tie normally used for bundling electrical wires, preferably the white one, as better visible through the vent opening in the rear side panel through the open trunk door (in my photo it is black). 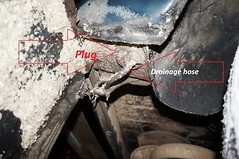 Notice: Having inserted the hose through the hole in the plug, I put a rubber sealing gasket of the same diameter on the hose from the lower end, then pressed it to the plug underneath and locked it with a small wire bundle tie. I believe, this will provide additional vertical fixation of the hose in the plug opening and additional protection of the body cavity against water entry from underneath. Another tip: to insert a bundle tie for the above-described purpose, one does not necessarily need to fully dismantle the side panel. If an instrument like hemostat is available, just removing three screws will do (pls see the photo below). 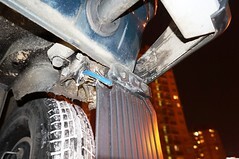 When visiting Lada dealership, I approach new Lada4x4s to check out the above-described rubber baffle position. During my latest visit, I found it pushed-in in all three cars being there on sale (the right-side ones, by the way, I don’t know why). Perhaps that has something to do with the pre-sale car washing process (stream direction …), but this is not a point. The manufacturer could have easily implemented my idea about using a bundle tie to fix the baffle, but we are still there. Brand new cars are sold and bought with the old defect and probably with some water (after washing) behind the rear wheel arch. Weird. Последний раз редактировалось Дмитрий1960; 21.03.2018 в 12:56. Текущее время: 21:38. Часовой пояс GMT +4.